Today, devotees wishing to see the Lord in this wonderful form throng to Guruvayur, a town in southern India, to have a glimpse of the presiding deity Lord Guruvayurappan. Ancient scriptures mention that Uddhava, Krishna’s great devotee, cousin and minister, had worshipped this image. After Dwaraka’s destruction, the image was brought to current location by Brihaspathi (Guru of Uddhava and the Devas) and the wind god Vayu. Hence the name, Guruvayurappan. 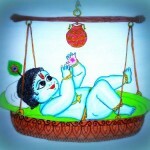 This vigraha is made out of a rare substance – pAthAlanjanam (anjanam – dye found in pAthAla– nether worlds). The legend goes that when Brihaspathi and Vayu were searching for a place to install this image, Lord Shiva came out of Rudra thirtham, a sacred tank still found in Guruvayur and advised them to consecrate the image in that location itself. The holy place then came to be known as Guruvayur. The Rudra thirtham is also mentioned in Srimad Bhagavatam as the lake where Lord Shiva advised the Prachetas and gave them Rudra Gitam – verses extolling the greatness of Sri Hari. There are innumerable temples in India for Lord Hari. Although there are so many holy places, the manifestation of the Lord is different in each of these places. So is the mode of worship. For example, in Badrinath, the Lord is pleased when a devotee performs penance. In Pandharpur, it is singing the divine names that pleases Him the most. Similarly, in Guruvayur, Lord Krishna is pleased when He hears a devotee reading Srimad Bhagavatam and immediately blesses him/her! There is an interesting incident in the life of Sri Narayana Bhattathiri’s that illustrates this. Narayana Bhattathiri, an ardent devotee of Lord Guruvayurappan was suffering from an incurable ailment. He was in severe pain. 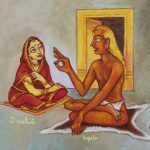 To relieve himself from the suffering, he prayed to Lord Guruvayurappan and started composing Narayaneeyam, which is a condensed form of Srimad Bhagavatam. It has been composed as dasakas (10 slokas in a chapter) and contains 100 dasakas. It is said that as Bhattathiri completed each dasaka, the Lord nodded his head as a sign of accepting Bhattathiri’s work. At the end of 99th dasaka, the Lord appeared in front of Bhattathiri and also cured him of the ailment. Bhattathiri himself mentions the divine vision in Narayaneeyam in the 100th dasaka which begins, “I see The Lord in front of me….”. Even today, Srimad Bhagavatam and Narayaneeyam reverberate in every corner of Guruvayur. 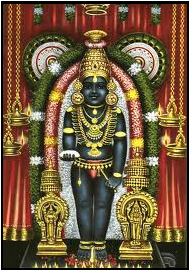 Every year, the Guruvayur festival (Utsavam) is conducted during the Malayalam month of Kumbh (Feb-Mar). The festival is a mix of religious and cultural events. It is a 10-day festival that starts with an elephant race. The winning elephant is given the honor of carrying the Lord during His processions in the forthcoming year. After 10 days of celebrations, the festival is concluded with Arattu. The Lord is taken in a procession to Rudra thirtham and a special abhishekam (divine bath) is performed. This year the festival will be celebrated from Feb 23-March 3.